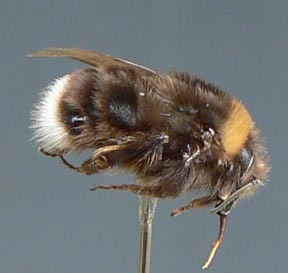 In the early Spring, bumblebee queens come out of hibernation and look for a suitable place to create their colonies. They are opportunistic nesters, always choosing a location that is dry with existing insulation material. We often find them in bird houses, utilizing the old bird nest material from a past year. They also commonly nest in the insulation under houses and in walls, in grass clipping piles, compost piles, hay piles, and old mouse nests. 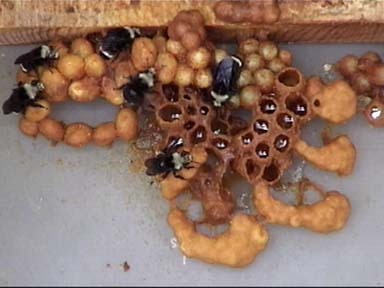 The queen builds wax cells in which she lays her eggs which were fertilized the previous year. She sits on the eggs (like a broody hen) until they hatch into larvae sharing what is called a larval pod. The queen forages pollen and nectar to feed the larvae for about 14 days, at which point the larvae spin into their own pupa cell (like a cocoon) that they pupate in before emerging as an adult bee. This process takes about 28 days from the time the eggs are laid. At first, the queen populates the colony with female workers that take over feeding the young and other responsibilities similar to honeybee workers. 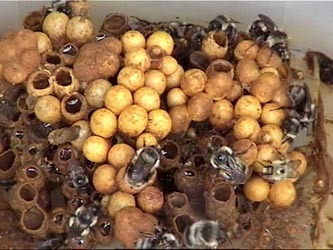 Once she has raised a work force, the nest goes into a reproductive stage in which all the eggs laid will hatch into males or queens that leave the nest to mate. 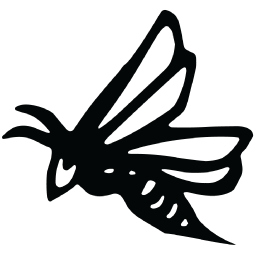 The young queens feed intensively to build up stores of fat for the winter before going into hibernation and as the weather turns colder, all of the drones and workers die. This completes their life cycle for the year. The queens survive in a resting state (diapause), generally below ground, until the weather warms up in the spring. The earliest species of bumblebees start their nest around here in late March or early April. The latest surviving species complete their life cycle in mid-August, although most are done by July. 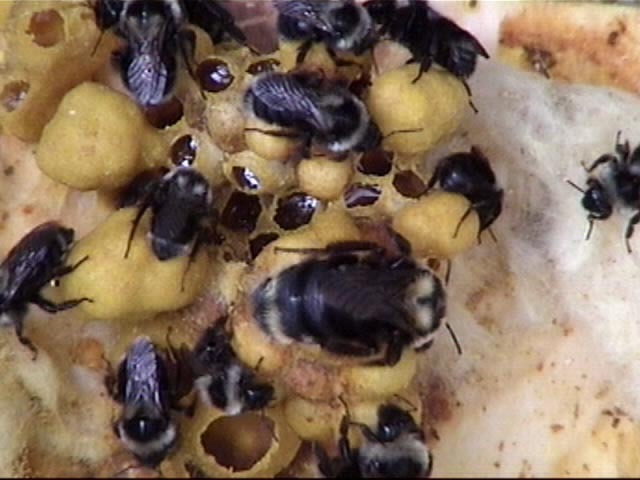 Nest size depends on the particular species of bumblebee, most forming colonies of between 20 and 100 individuals. 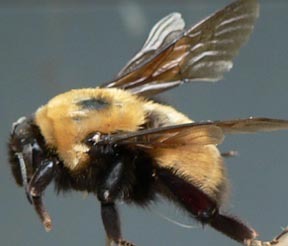 Bumblebees will not do any damage to your structure should they decide to nest in any part of it. B.melanopagus are easy to recognize with their bright orange abdomen. They are a relatively common species in our area and are the species that we have experienced being the most aggressive in defending their nests. B. occidentalis was once common to the area, with their numbers representing at least 25% of our local bumblebee population. In 1998, this species mysteriously disappeared from the Puget Sound region. In 2012 and 2013, there were a couple of reported sightings in the Seattle area and on the Olympic peninsula. Hopefully their population is slowly making a comeback.